Was sich im letzten Jahr so alles ereignete, können Sie dem Bericht unseres 1. 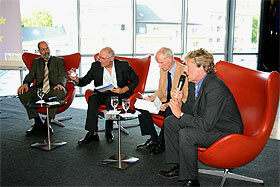 Vorsitzenden, Robert Tonks, anlässlich der Jahreshauptversammlung 2009 entnehmen. We started the year with a New Year’s drink on 8 January. At our first 2009 meeting we presented the draft of our new website, which met with people’s approval. Suggestions for alterations, improvements etc. were noted. At Mercator Concert Hall, on 1 Februar, we had a special – and seasonal - treat from Scotland. Soprano Lora Anderson and tenor Jamie MacDougall sang a selection of Joseph Haydn’s seldom heard Scottish folk songs. Did you know, that in all, Haydn composed in excess of 400 Scottish songs? The Haydn-Trio Eisenstadt rounded the evening off with pieces by Haydn and Beethoven. Many thanks to Duisburg Philharmonic Orchestra for their cordial invitation and an excellent and entertaining evening. The Duisburg University English Thespians (DUET) performed Oscar Wilde’s "THE IMPORTANCE OF BEING EARNEST", on four nights, February 3rd to February 6th. Oscar Wilde, himself a true dandy, wrote this much-loved play around 1890 as a brilliant satire that made fun of the upper crust. At our 5 February meeting we marked Robbie Burns’ 250th birthday by having our very own Alison (Mac) Arriotti – supported by Klaus (Mac) Barbian supplying the German "translation" (or was it Dutch!?!) - citing some of Burns’ work, rounded off with a splendid chorus of "auld lang syne" (no bagpipes). On 5 March we had a belated St David’s Day celebration including a sing-song and an excellent recording of Jonathan Darlington telling us the story of Little Red Riding Hood according to Roald Dahl. The latter was born in Llandaff near Cardiff and went on to become one of the capital’s all-time best-selling authors. Klaus Barbian gave us a talk at Volkshochschule on 1 April about his "second home", i.e. Durham and surroundings focusing on Durham "Land of the Princes and Bishops" and especially the City of Durham. The following day, 2 April, we had our regular "first Thursday of the month meeting". Klaus Thiel-Klenner, director of Duisburg Shakespeare Company, plus fellow member, Michael Kaufman, turned up at our regular meeting on 7 May to tell us about the work of the drama group. They focus on making Shakespeare easier to understand and interesting to today’s audiences, by giving classic plays and scenes a modern-day twist. This time our CityTalk on 28 May, the fourth such event since launching it in 2006, featured Dr. Ian McMaster, editor-in-chief of Business Spotlight, Konrad Fuhrmann, European Commission and Professor Heinz–Jürgen Axt, Jean-Monnet-Professor at University of Duisburg-Essen. Duisburg Mayor Adolf Sauerland welcomed 120 guests in City Palais, which has become our traditional venue. An interesting talk about languages in the EU on the eve of the elections to the European Parliament ensued. Co-organizers were Europa Union, Deutsch-Französische Gesellschaft, Stadt Duisburg - Amt für Europaangelegenheiten, supported by Europe Direct. Our last regular meeting before the summer break took place on 4 June. Plans for Summer hols were to get in the way of our July meeting, which we decided to cancel. So on the first Thursday in June Romain Galati told us about his plan to set up a regular (once a week) Language Cafe beginning in June. It did in fact take off at Hundertmeister the following Wednesday - with a little help from us – and is still going strong at the time of writing. Initiated by Deutsch-Britische Gesellschaft Duisburg e. V., more than 60 members of various civil societies which take part in the "Debate Europe" project, funded by the European Union, turned up in the pouring rain for our Europa Picknick at Landschaftspark-Nord on 6 Juni. Home-made delicacies from around the world contributed to a truly global afternoon feast. We had our summer bbq on 6 August, to which 30 people turned up. It was a brilliant evening, not least due to the Hundertmeister staff. Stephen Tipping turned up at the Hundertmeister studio on 3 September, taking everyone by surprise (almost). It was a splendid evening due to the multiple talents of St. Hellens’ very own Steve Tippinthepresentcontinuous. Can Steve whistle without moving his lips? Yes he can, Steve the ventriloquist whistler! Incidentally, Steve’s repertoire reminds me of the hard drive I have dedicated to my favourite tunes, only better. This year’s British Days and Country Fair, followed by "Last Night at the Proms" on the green inside Linn Castle, Krefeld, on 12 September, was a great success as always. Twenty of us - members and friends - turned up for this traditional outdoor, life-style event. On 1 October, taking everyone by surprise (again), Sandra Meyer, lecturer at Faculty of Anglophone Studies at Duisburg/Essen Uni, delivered an excellent account of five of her favourite novels, selected from Anglophone cultures around the globe. 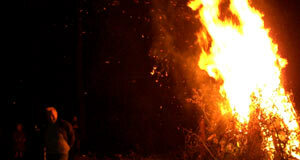 We decided to go ahead, brave the elements and have our Guy Fawkes Bonfire on the night itself – on 5 November - despite a poor weather forecast. It turned out to be a fine evening. So most of the time we spent assembled around this year’s splendid fire. Jani and Steve Tipping gave us a rendering of their best-of at Volkshochschule Duisburg, König-Heinrich-Platz, Friday, 19 November. A full house came to check out their repertoire of unplugged tunes to enjoy and sing along to. It turned out to be the best after work party this year! This year’s annual general meeting will take place at Hundertmeister on 3 December.